All of a sudden there seem to be jazz jams around. I'm mulling this at the moment. Why, the multiple jam sessions when the performance scene is otherwise so dilapidated. 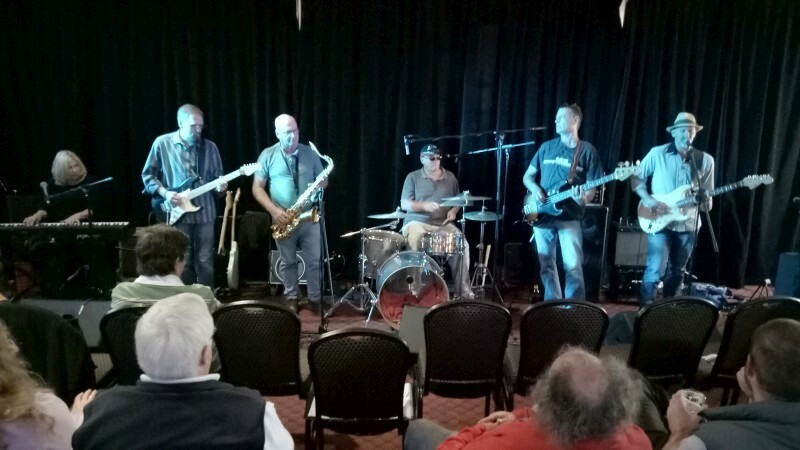 The ructions at the jazz school reduced the numbers of students around town; the regular touring bands have mostly disappeared; the lively jazz experimentation seems lacking or maybe it's underground. But we have these jazz jams. There's still a desire to play with others and to find colleagues. Maybe it's the disruptions that lead to this scene. Whatever, I attended the Smiths Sunday session to find a great host band and a few sitters in. A comfy scene, good music and some obvious appreciation from the non-jazz followers. So worthy, entertaining and enjoyable. Keep it up. The host band at Smiths Sunday session was Josh Buckler (tenor, convenor), Hugh Barrett (piano), Barney Briggs (bass) and Mark Levers (drums). Sitins were Andrew Howard (drums), Mitch Preston (drums) and Eric Pozza (bass). 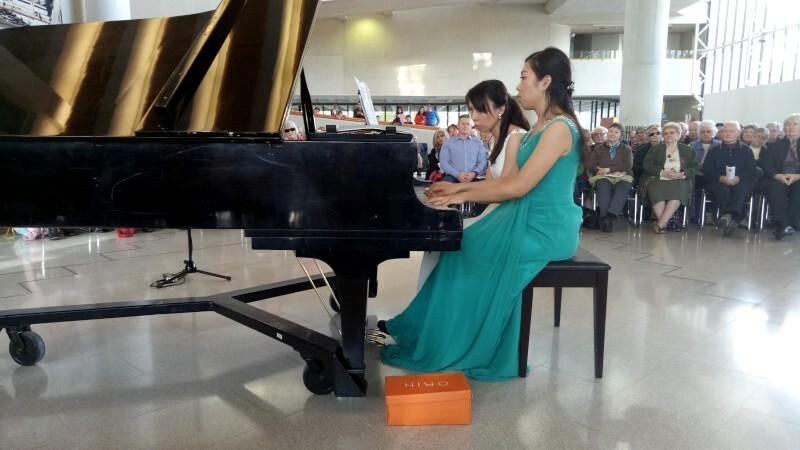 Two pianists, four hands, one piano. 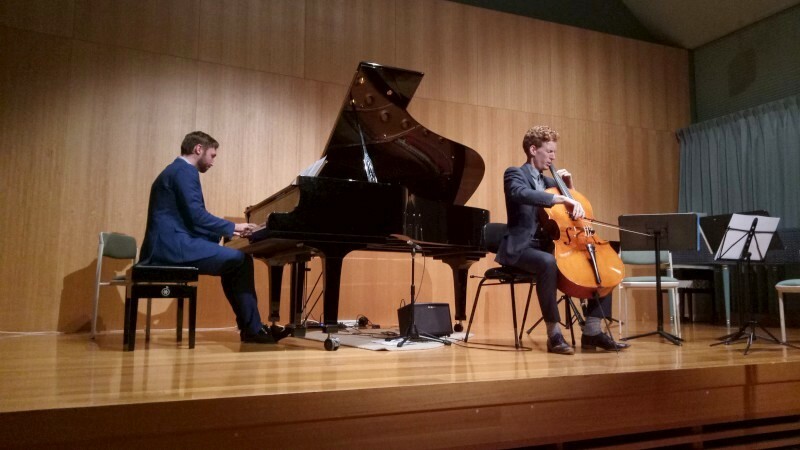 The Australian Piano Duo doesn't always play on one piano, but it can and did at the High Court. 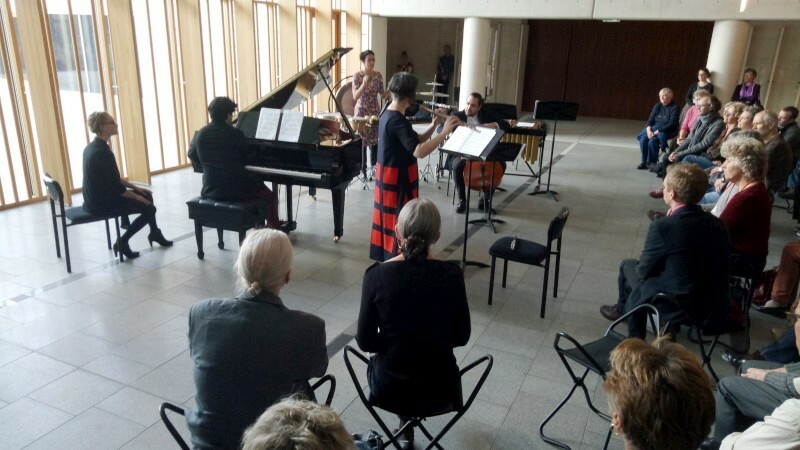 The APD is Vicky Yang and Maggie Chen, born in Taiwan, grown up in Australia, studied in the US and Europe and Ensemble in residence at the Con at Griffith Univ. A friendly pair with a very varied repertoire on the day. First up Schubert Fantasy Fmin, lovely, lengthy, a serious, traditional work. But then a diverse package. John Pitts Glittering gamelan with various noisy, clantering bits put in the piano for preparation, clincky and buzzy tones, performers' bodies spread one over the other to extend ranges. One keyboard can be a little thing, only 88 notes. I had a good view to see some fingers nestled under hands, digits avoiding others, I guess inevitable, but the physical stretches were unexpected. Then some interesting studies, I understand they were transcriptions by the Vicky and Maggie of Oriental folk songs. Then several Valery Gavrilin [Russian] Sketches and an end with Piazzolla Libertango (again with occasional physical contortions). I enjoyed the richness and added complexity of the four hands, was close enough to see how the structures and accompaniments and melodies worked with more parts, admired the unity that had melodies move from one hand to another player with ease and comfort. I guess one requirement is the ability to work so closely together, both physically and artistically. This felt comfy in both ways, if sometimes just a little amusing when one hand reached over the other two or three. 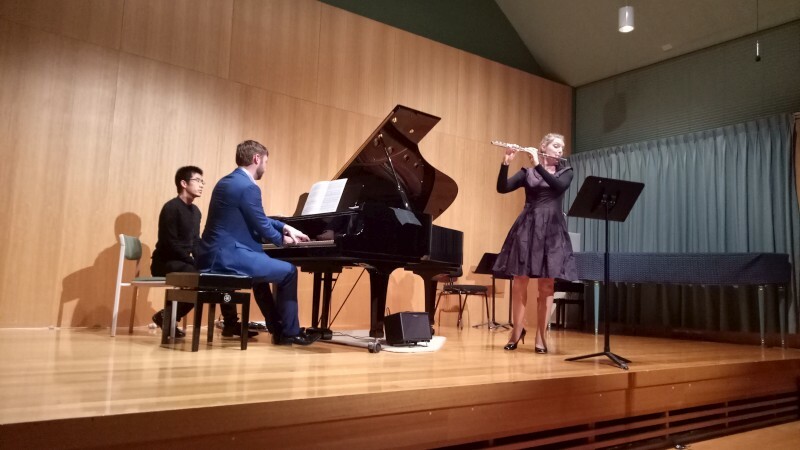 Investigating further, I discover the Australian Piano Duo Festival, in its third incarnation in Qld, where this duo is based; an interesting coincidence. A lovely, satisfying concert by two players working very well as one. 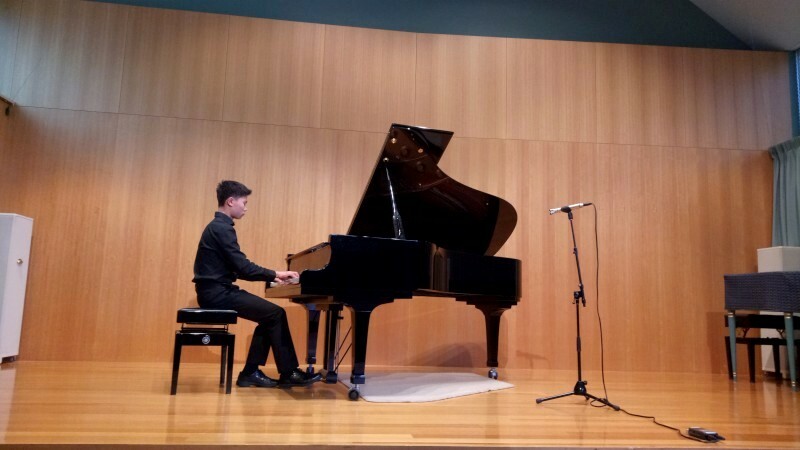 The Australian Piano Duo comprise Vicky Yang and Maggie Chen. They performed at the High Court. Blusicians was the name used by one of the bands at the Canberra Blues Society jam session on Sunday, but I guess they are all that. This is blues, endless variations on a few chords and their pentatonics and some solid rhythms, but how nice it can be! Simple but earthy. I used to attend regularly, but ages back. Now it's just occasional, but it's great to sit in, mostly knowing the formulae, trusting the others around are good for the tweeks of the individual tunes. And there's some seriously good gear there, too. I drool over Bucky's bass amp that feels a million dollars (Mesa-Boogie) with wireless input (new to me) and the JBL PA rig and the rest. This time the host band included a few mates, Dean and James. I caught up with Ross and got a spot with some of the heavies for a very decent few tunes. Some other bands and musos I didn't l know. A few performers and mates I did: Leo, Nicki, Bucky, John VB, Mitch, Ross. 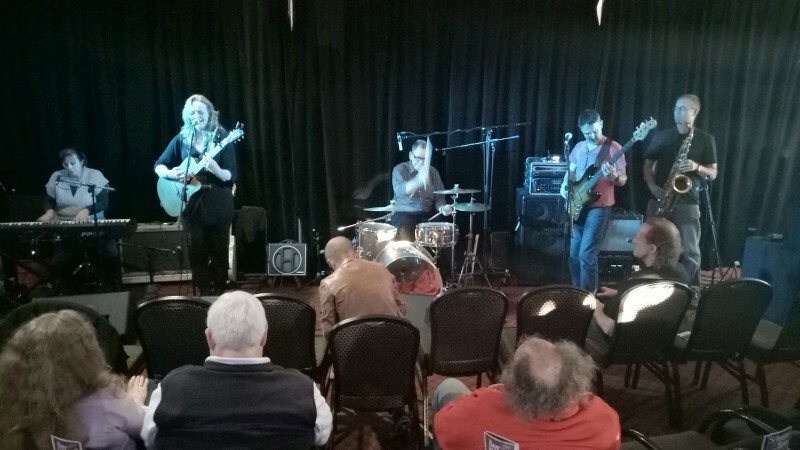 And this time, Marisa Quigley turned up as a highly regarded visitor, playing with Ali Penny, Mitch and James. Good and a very different presence from the laconic blokes with Fenders. The women might dance. And it's at the Harmonie German Club, so decent beers at reasonable prices and schnitties. I always enjoy Mitch's terse and correct drums (he's a pleasure to play with: understated and just plain correct) and James' tenor was a huge pleasure, especially playing off Marisa's vocals. I missed most of Leo's set, but Ali and Ross appeared as very different piano propositions: Ali all telling the story; Ross all boned up and busy. 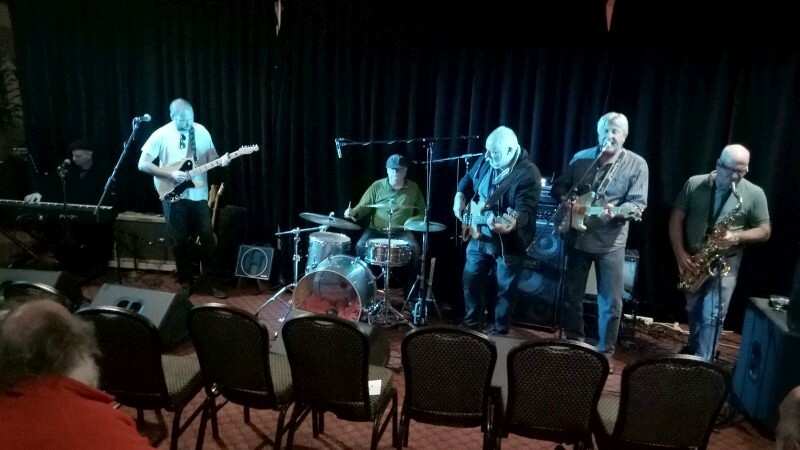 The blues scene is somewhat aging: much of it is the product of an era of youth, of the British blues explosion (I don't usually talk of recoveries from operations at other venues). So be it. This is growing old gracefully if mildly disgraceful and having great fun with good mates in the process. 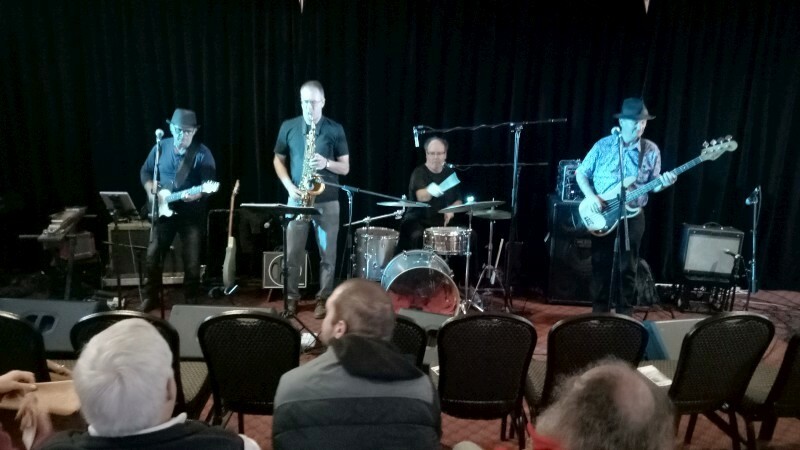 Thye Canberra Blues Society jam session was at the Harmonie German Club. 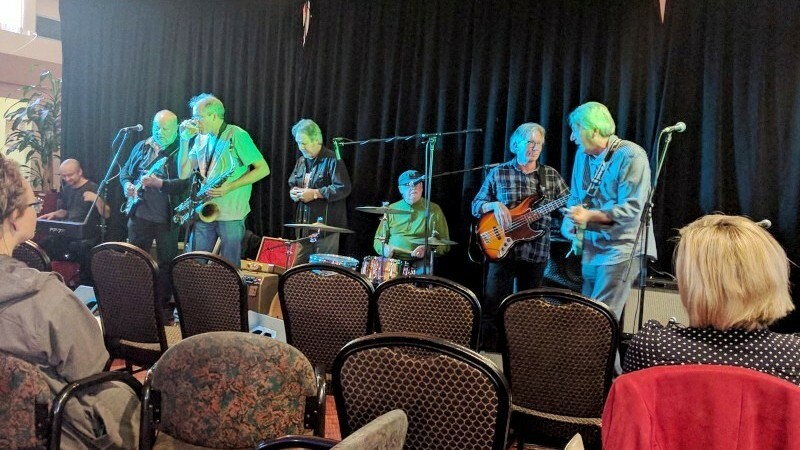 Players included James Hoogstadt (tenor, harp), Marisa Quigley (guitar, vocals), Mitch Preston (drums), Eric Pozza (bass) and a string of others. Mike 2 should really be Mike 1. 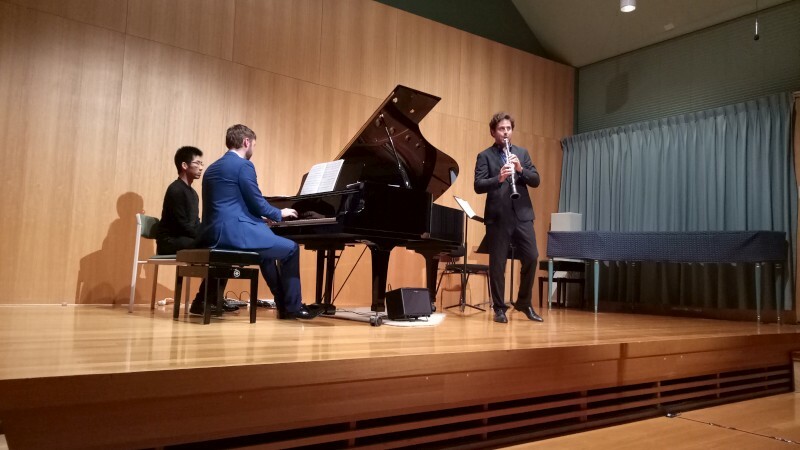 This was a concert by Andrew Rumsey and friends at Wesley leading up to AR's visit to the US - a visit that includes performances at several festivals and Carnegie Hall. The feature, longest, last programmed work was Mike Dooley's first piano concerto. It's scored for small forces at this stage, somewhat like a sonata for quintet, but what a successful, attractive work. Mike explained that it contrasts 4 against 3, symbolically grace against truth, moving through 3 and 4, combining, eg for 7 (although I seemed to count 5 for most of the second movement), moving through keys with 4 sharps or 3 flats and the like. I found it wonderfully convincing and satisfying. That's not all, AR also played a short piece for solo piano earlier in the show, by Mike, called Le Torbillon (=The whirlwind). This is the one Andrew will play at Carnegie Hall. So, from Canberra to Carnegie: today's small world. 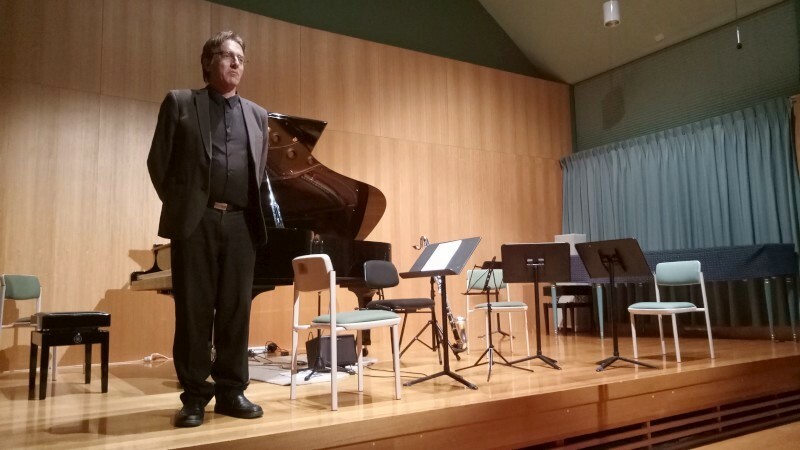 But otherwise the show was a series of shorter pieces, mostly solo piano or piano with one of two other instruments, and one solo guitar and one quartet. And it was a seriously interesting collection: Poulenc Novelette in Bb minor, Rachmaninov Moment musicaux, through a flute duet by Ibert, several by Ian Clarke, a clarinet duet with Jewish themes from Bela Kovacs and a slightly jovial film theme by John Williams, and some Piazzola, Milonga del Angel and Vuelvo al Sur. Then Paul McCartney Yesterday arranged for classical guitar and Speigel im speigel for a quartet of violin, cello, clarinet and flute. Then Mike's piano concerto and an encore of Saint-Saens La cygne for piano and cello. 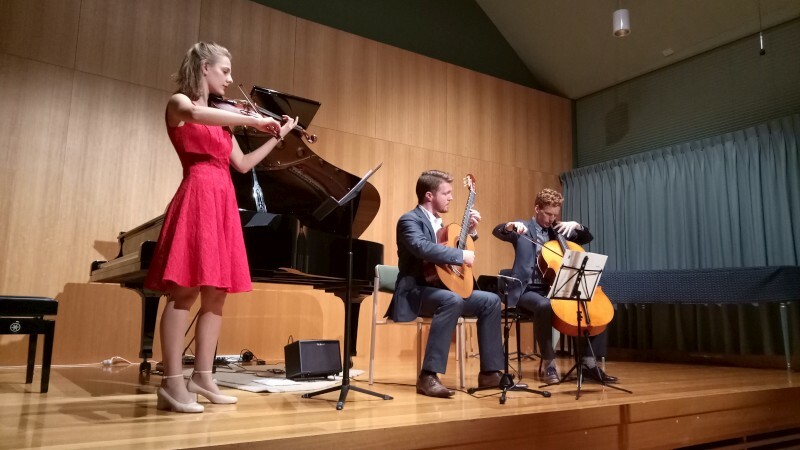 The playing throughout was hugely impressive with dense concentration, keen ears and hot chops, but there was also humour, if mainly from host Andrew, so this was a wonderfully entertaining but also challenging and satisfying outing. And Mike's fabulous, serious, impressive works were an absolutely core component. I can only be in awe all round. And Mike had another world premier for a song cycle sung by Louise Page the next day: sadly I missed that one. I am in awe. 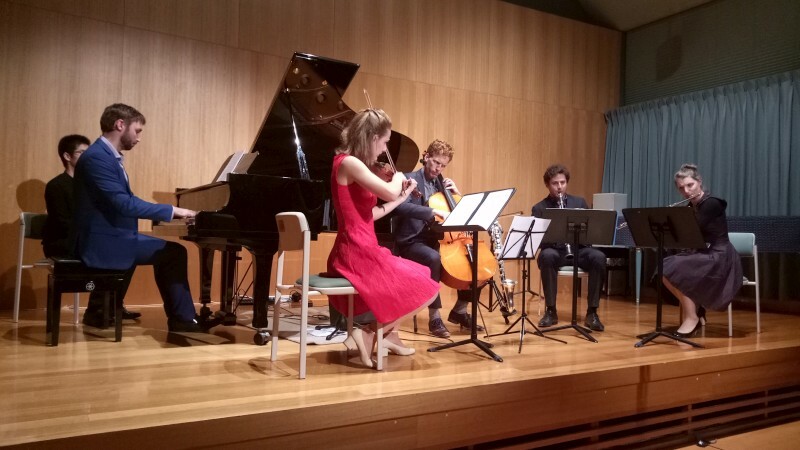 Andrew Rumsey (piano) performed with Laura van Rijn (flute), Thomas Azoury (clarinet), James Larsen (cello), Mia Stanton (violin) and Matt Withers (guitar) at Wesley. 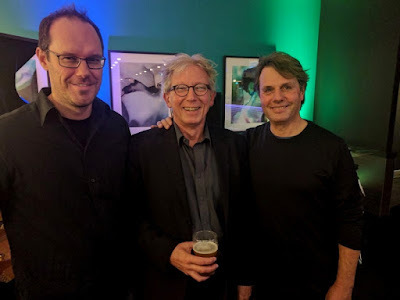 They performed Mike Dooley's first piano concerto (world premiere, scored for chamber group) and Mike's Le Torbillon, as well as a string of other modern composers. Good to have another play with Mike and Richard as Aloft at Muse. All standards, latins and the like. Solid work for double bass played with no amplification. I noticed that getting on to 3 hours. But some very enjoyable playing. But there was more from Mike this weekend. 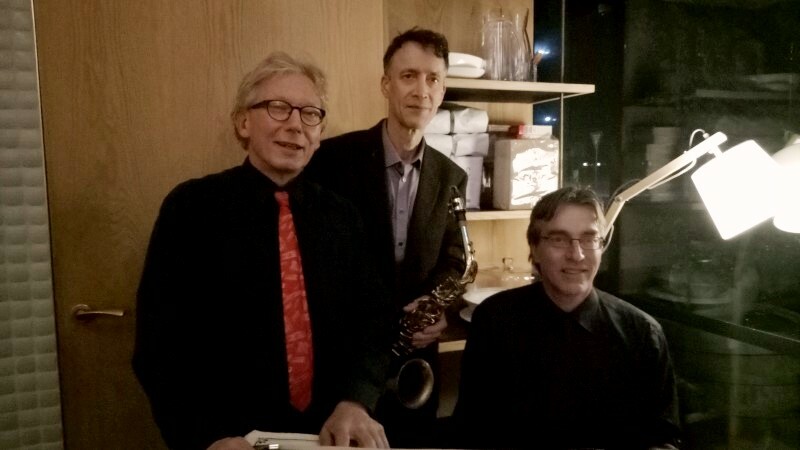 Richard Manderson (saxes), Mike Dooley (piano) and Eric Pozza (bass) played as Aloft at Muse restaurant. 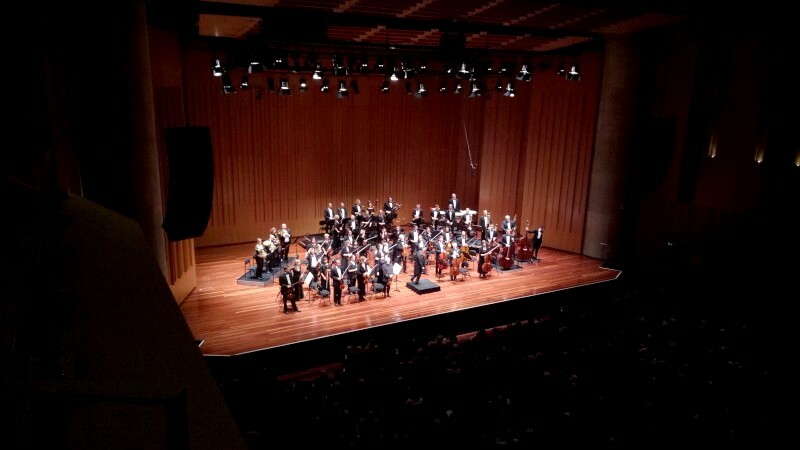 It's our CSO again and there were some interesting twists in this concert. It's the Cello concert of the subscription series. The cello featured Italian (Torino-born) cellist, Umberto Clerici, now principal at SSO and lecturer at the Sydney Con. He played Schumann Cello concerto Amin Op.129. Nice, all from memory as is done. 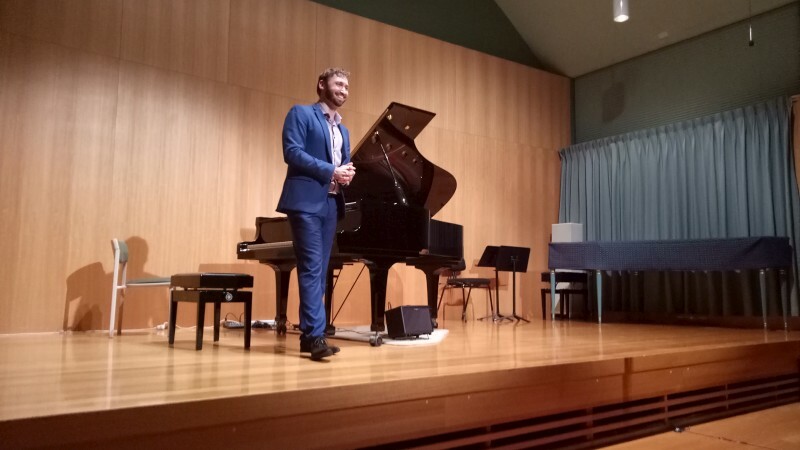 Some impressive playing, especially the encore which he introduced as a modern Italian/Australian crossover (if I understood correctly - we couldn't hear his patter too well) with a rocky second half. That was exciting and challenging and everyone was talking of it, at interval and after. Haydn's overture to L'isola disabitata preceded that. 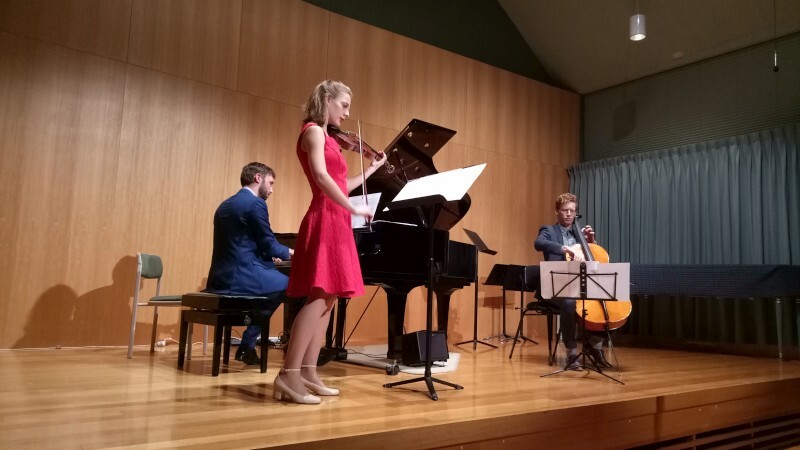 Then, after interval, the most Australian and the most intriguing piece of the night for me, Sculthorpe String sonata no.3 Jabiru dreaming. It's clearly an evocation of the outback - specifically Kakadu - and how true it was! I first noticed with bussing insects that were so true to aural life, then later with a few bird flocks taking off. All with non-traditional techniques - string slides and sul ponticello and stick bowing. Stunningly true to the sounds of the bush. Then the traditional tour de force, Brahms symph no.3. I am playing no.4 in a few weeks and discovering just how good is Brahms. This one I don't particularly know, but I could recognise similar fairly simple lines and twisted rhythms but this seemed to have more virtuosic bass parts. Satisfying either way. The conductor was another invitee, Stanley Dodds. I didn't find it easy to follow some of his instructions, often broad and bar-long, but these are professionals and he is Berlin Phil material. Hmm. Obviously I have much to learn in this field! But a good night out with our much-loved local orchestra. 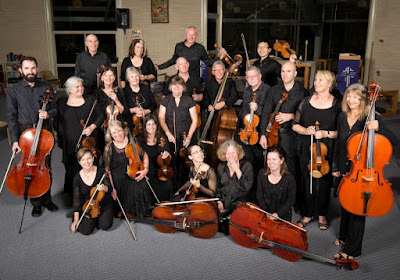 The Canberra Symphony Orchestra performed Haydn, Schumann, Sculthorpe and Brahms under Stanley Dodds (conductor) with soloist Umberto Clerici (cello) at Llewellyn Hall. 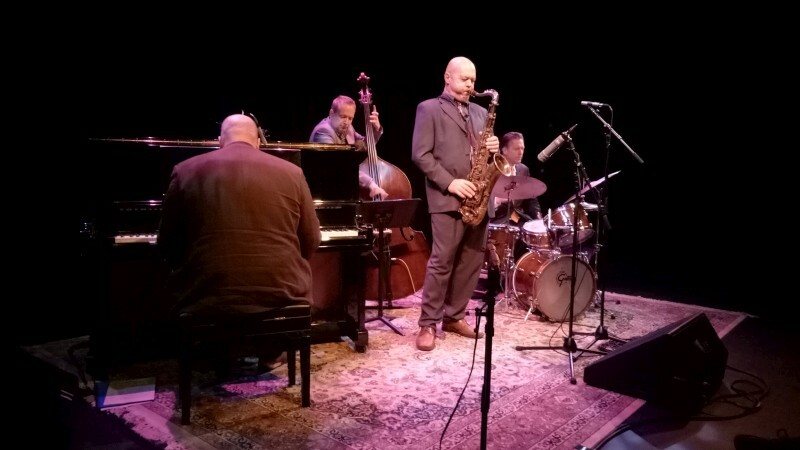 Maybe it's the quiet and close surroundings, or the U3A jazz appreciators as audience, or the infrequency of seeing these guys (and El) for some time. But maybe it was just the truly excellent and authentic playing. Lachlan and El and James. 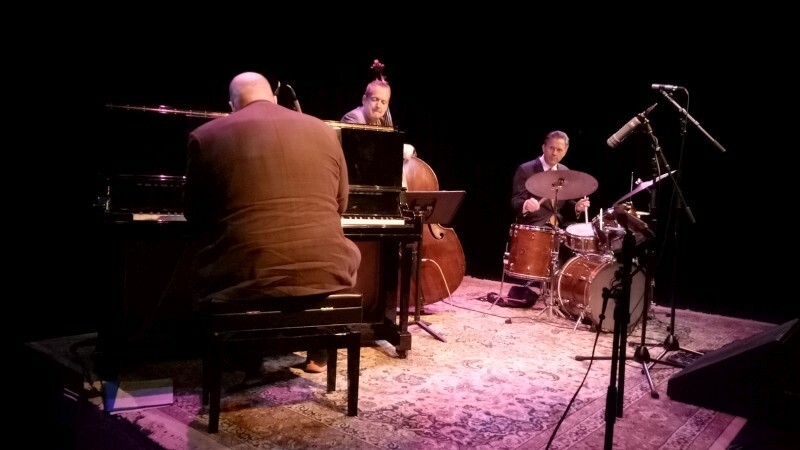 A drummerless trio playing an originals and a few standards. From the first notes I just indulged in it and I wasn't alone. Lachlan setting lovely rhythms, steady and relaxed. El coming in with lovely sustained tones on violin, spelling melodies with little twists and soloing with the most exquisite phrasing, lots of sequences, notes changing over time as they can with the bow, varied lines and interpretations. Then the solos passed, to Lachlan, more sustained lines, perhaps chordal, maintaining eighth or sixteenth notes, always purposeful, as I've been so impressed by on recent YouTube outings. 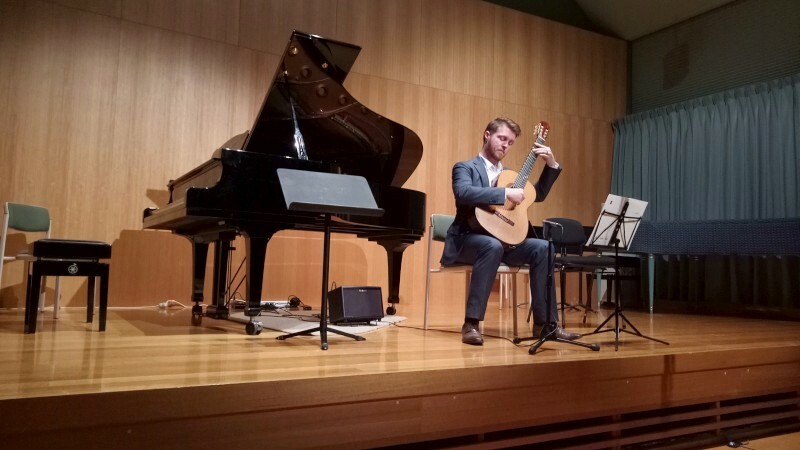 Then to James, superbly flexible, freely moving through scale degrees and up the neck, always spelling the chords with joy and clarity. El had penned the one original, Stevie's song. First up was by Zappa (! ), Blessed relief (El commented that it wasn't rude like many others, but there were no lyrics anyway). And some faves: Out of nowhere, I'll remember April, All blues, A ghost of a chance. And one from left field: Bach, JS, the first prelude from Well Tempered Clavier. Wonderful melody, nice solos based on the chordal movements. An interesting venture, but then Bach is God for all musicians. I'll remember Lachlan's courteous precision, James' easy melodicism, El's overwhelming sense of intriguing phrases and quick sequences. A fabulous, intimate concert and, given how infrequently I've seen these deeply satisfying musicians recently, a remembrance of things passed. 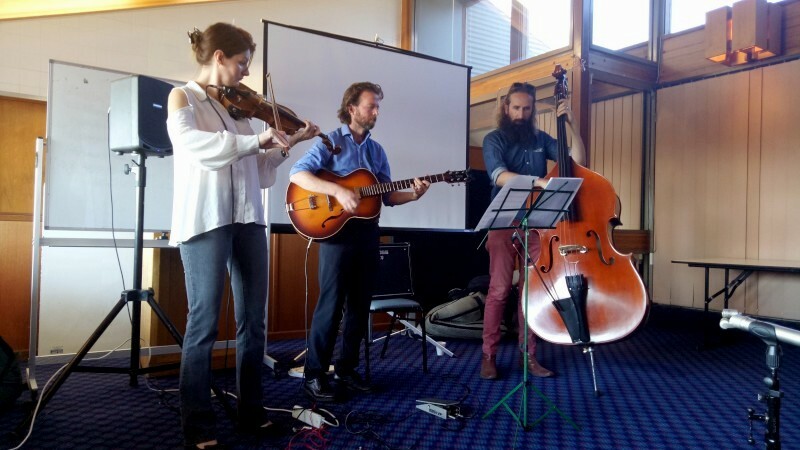 Lachlan Coventry (guitar), El Osborne (violin) and James Luke (bass) played for the U3A Jazz Appreciation Society at the Raiders Club Weston. They're coming younger, or I'm getting older, but it's been ever that way - think Mozart. This was Jonathan Lee, playing piano, still in Year 11 but with organ and cello under his belt, awards and prizes and double AMusA almost in place and a Licentiate on organ. Nice program, too: Bach, Beethoven, Brahms, Debussy. And not a sheet of music on stage. The Bach was from Partita no.4 Dmaj, melody moving between hands, nicely elucidated; the Beethoven was Sonata in Cmin Op,19 no.1, played with conviction and nicely slow second movement; the Brahms was Rhapsody in Gmin Op.79 no.2, heavy, morbid, Jonathan suggested an eerie graveyard before playing; the Debussy more French, Passapied from Suite Bergamasque, relatively flighty, light, a courtly French dance. Nicely done. Jonathan Lee (piano) played Bach, Beethoven, Brahms and Debussy at Wesley. My Mothers' day this year will be remembered for a 4 hour gig in a shopping centre. There's a solidarity amongst performers, musical or otherwise. The pic is of fellow employees serving lollies for the last shopping session before Mothers' day. It was a long gig but straightforward, playing fake book standards and latin and jazz tunes. Lots of comfy tunes but it's busy when you are just playing as a duo. Bass solos in every tune: good for chats with Mum. 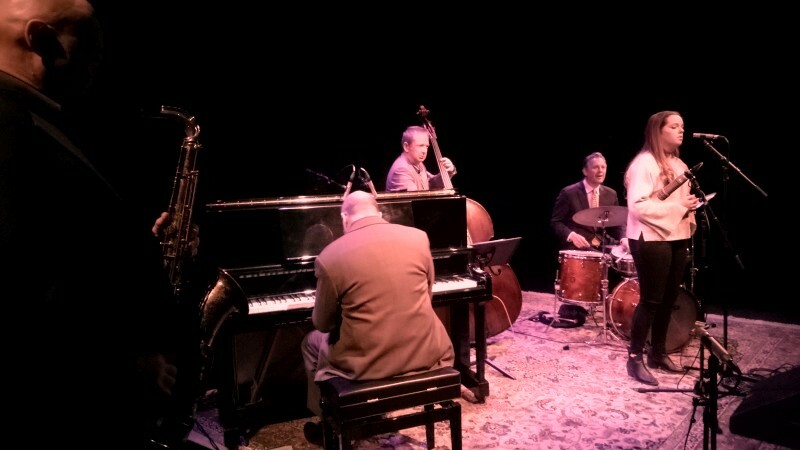 Again a great pleasure to play with Hugh Barrett. He's such a strong and certain player. Also a pleasure at public gigs like this is the visitors. Rachel Thoms and her mum rocked by for a chat; so did Bill Sweeting, father of Luke. 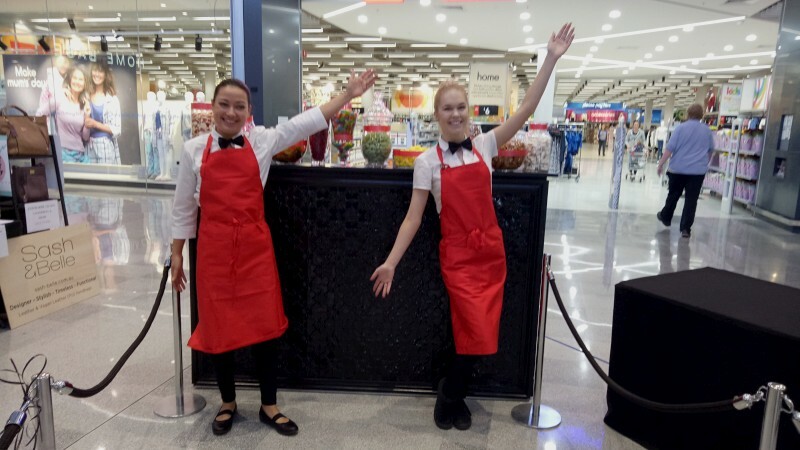 The shopping centre: our update on the Roman Forum. Hugh Barrett (piano) and Eric Pozza (bass) played for Mothers' day. It's not too often but sometimes you hear players that can just play, they are just hot. 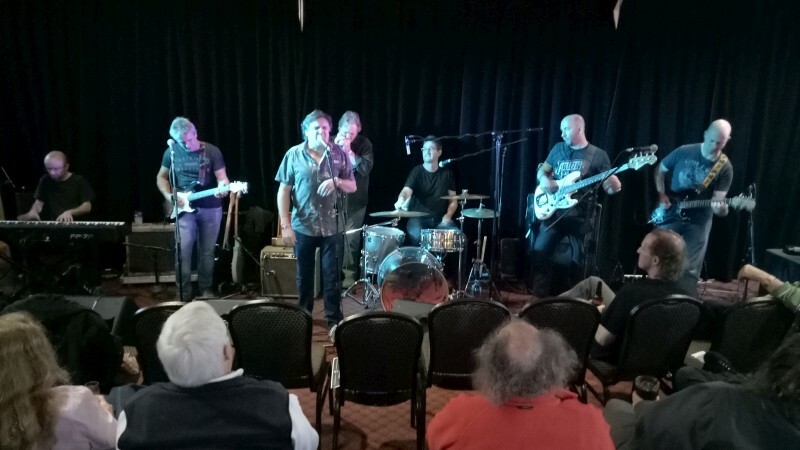 It's not the first time that Joe Farnsworth and Brendan Clarke and mates have been here in Canberra, but I'd forgotten the drive and sheer energy of it all. The chops. They did two sets but just a few tunes: The night has a thousand eyes, Along came Betty, Moments notice and a bass solo (evidently dropped on Brendan without notice: he played free then Beatrice). There's good feelings here, especially from home-towner Brendan who's full of mates in the audience. And there's that jazz improv, in program as well as playing. They have short chats between tunes to decide what to play, perhaps some instructions, then into playing so capable you wouldn't know it's not heavily prepared. But of course it is: as Bird said, practice for hours then forget it all and just play. And this comes to jam-like invites, too. So Sophie Edwards, who had played with the band last year, sat in again for Corcovado and Wayne Kelly was up to play a Monk tune. All seat of pants stuff but great when played with guys like this. The second set was mostly a Coltrane medley: Afro Blue, Naima and Blue Train. They joked about a train wreck but of course, despite some uncertainties, the playing was a dream. 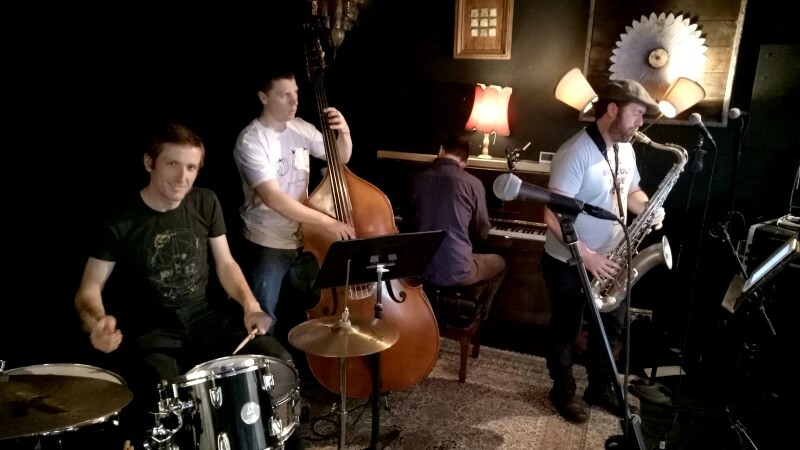 Lots of energy, lots of adventurousness, lots of deep-rooted swing. 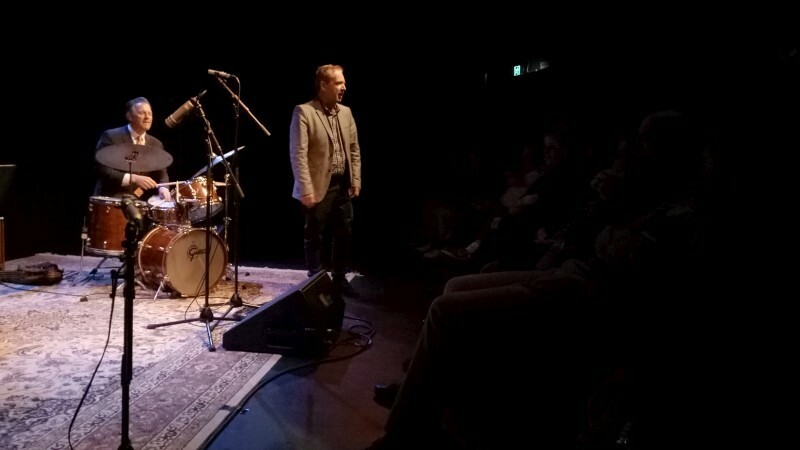 Then a drum solo, written by JF after visiting the Australian War Memorial last time he was in Canberra: rudiments and military-like, memorial slow-march flams. I love that American marching-band influenced, rudiment-rich drumming. And out on C-Jam blues. 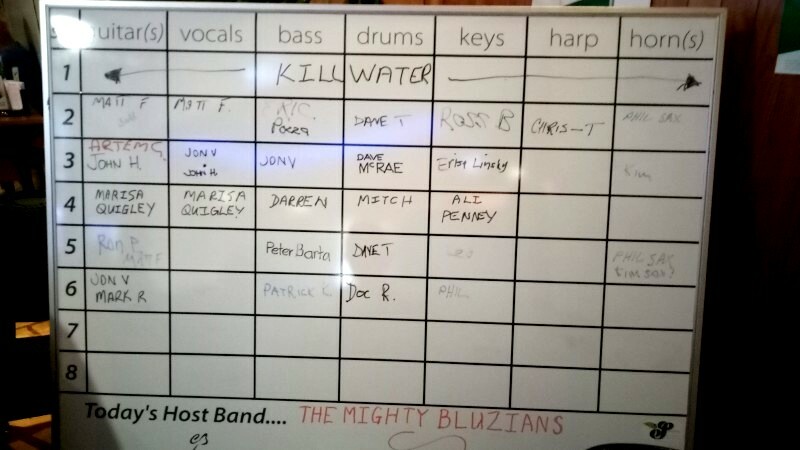 John was more reticent, considered player; thoughtful; Dale the determined hard-bopper with huge fluency and tone; Brendan the mobile and incredibly swinging bassist; Joe the pedigreed drum-master with an impressive list of sideman calls and big ears to his colleagues. Just a display of immense chops and determined swing for some of the most competent and purposeful hard-bop that I've ever heard. As for Brendan, Clarkey's our local mate who pulled all this together. 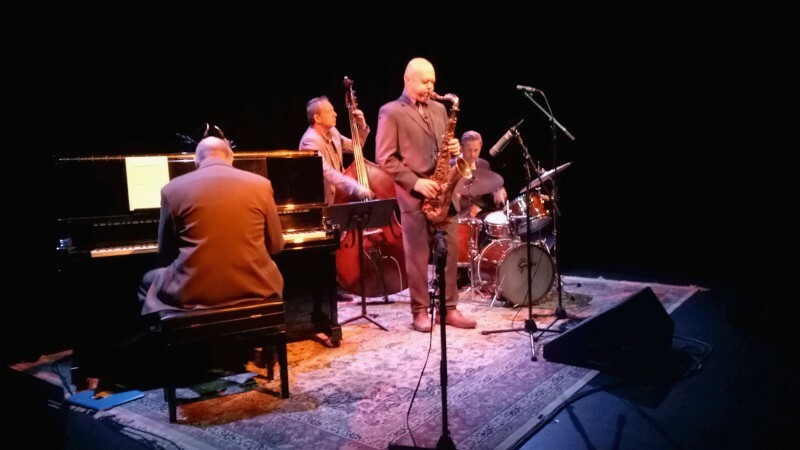 Joe Farnsworth (drums) led Prime Time with Dale Barlow (tenor, flute), John Harkins (piano) and Brendan Clarke (bass). Wayne Kelly (piano) and Sophie Edwards (vocals) sat in. The concert was called the Art of Rhetoric. 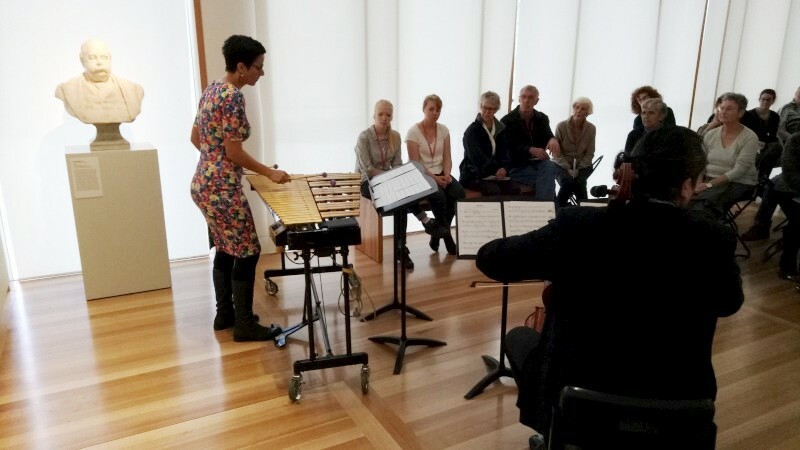 It was essentially the words of various politicians put to music by composers Robert Davidson and Gordon Hamilton and performed by RD's band Topology and the combined choirs TAV (The Australian Voices) and our local Luminescence Chamber Choir under GH. The first half was less effecting. 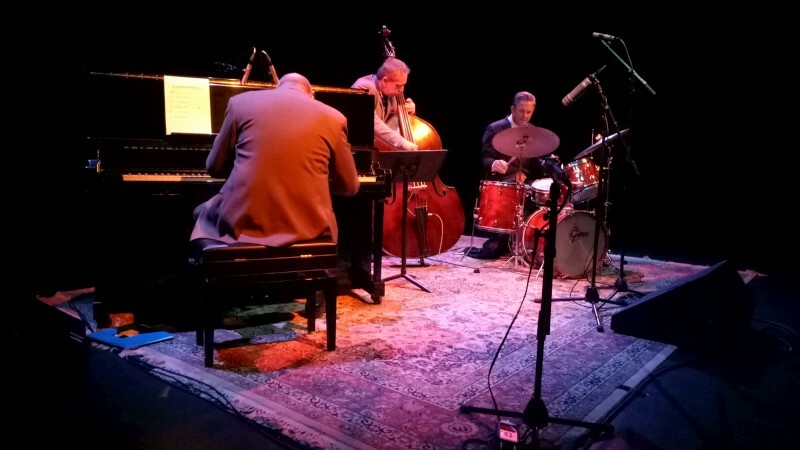 There was considerable minimalist four-to-the-floor regularity, repeating lines, occasional jazz improvs or written conversations between instruments (not least all the strings, violin, viola and bass). But the key was the treatment of speech. RD would listen to the patterns, the phrasings, the moving pitch and tempo to write a line to accompany selected lines of speech or sometimes just accompany with a wash of sound or an aural counterpoint. The first half featured this style, with words from David Malouf, Jessie Street, Charles Kingsford-Smith and Menzies and some ever-sad words of Abbott. That was the start of the tragic story recited from Australian politics. I chatted a day later with someone who was there, who had worked in Parliament House, and we could only bemoan our recent inability to deal with issues. It seems worse now, but there in some ways the Singing Politician recounted a history of tragedy with little light. There was one of Tony Abbott with one of his simplistic slogans, "No no no". Note, ever in three; ever a slogan. He understood rhythm if not the ease and costs of destruction versus the difficulty and hope of construction: think car industry, govt agencies that fell in one swoop, Julia Gillard for that matter. There was Menzies, the sainted one: we all know the quote about entering the war because the mother country had, but there was also melocholy in his further words of a price to be paid. Billy Hughes about Gallipoli, the Dark hour, and John Curtin about the war approaching Australia and John Scullin, sworn in only 2 days before the Stock market crash of 1929 that ushered in the Depression and, indirectly, another war. And Fraser with his infamous line about the easy life or otherwise: this was done 4/4 minimalist with polyrhythms. The Dismissal was the biggest work, using multiple voices for a long rendition. I hadn't remembered a younger Keating line, "a completely unprincipled act", but I did remember the chants of "We want Gough". Also here was choral accompaniment with a remelodicised God save the Queen: interesting. I hadn't remembered Bob Hawke, then ACTU head, on the day of the dismissal calming workers with a warning of a "snowball into violence". That was admirable (and prescient as we watch democratic politics crumble under right-instransigence and growing inequality and climate and the rest). Also Noel Pearson in his euology to Whitlam recognising Gough's good work for Aboriginals: "The reward for public life is public progress". Howard just appeared as a cricket tragic seeing politics as a parallel game: "politics and cricket ... playing the game, yeah". There was the profundity and truth-telling of Keating's Redfern speech: "the problem begins with us ... it begins in an act of recognition that it was us that did the dispossession ... we took the children from their mothers". [NB: how could you not despair after Stolen Children, with institutional child abuse and deaths in custody and Manus/Nauru as emotional darts to our civic hearts]. There was a fascinating play with the Rudd Apology speech, where two words were extended to several minutes and sung by the choir and recorded, then, live, played back, faster and faster until we heard those words again: "We apologise". Then Gillard "Not now, not ever". I sat thinking of the young women singing those words and how they would relate to this recent feminist history. Then a summary piece that featured various boorish and barbaric quotes: I'm a fixer; No cuts to education, health; the recession Australia had to have; suppository of all wisdom; PM Trumble; Please explain; People have a right to be bigots; by 1990, no child will be living in poverty; shirtfront; kids overboard. Then a final encore on Trump and "total political correctness". So I listened and mighty was the playing, the composing, the voices, not least Luminescence who got their part together in no time, but more so I found myself despairing of this country and its uninformed self-image: forever now "Great" or "Fair go" in the talk of pollies but the home of climate denial, inequality, misinformation and more, once the light of the world with emancipation and the rest, now this timorous server of wealth and denier of evidence. This is music but more. Excellent for the political tragics amongst us. 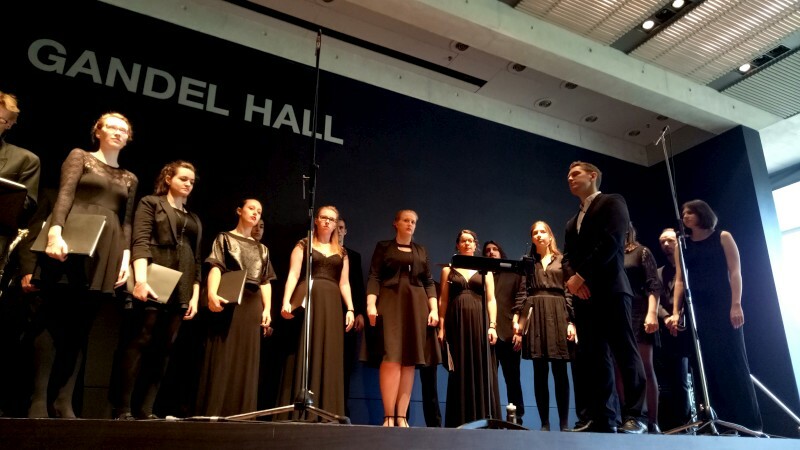 Topology, The Australian Voices and Luminescence Chamber Singers performed music by Robert Davidson and Gordon Hamilton, mostly on political themes, at the National Gallery of Australia. 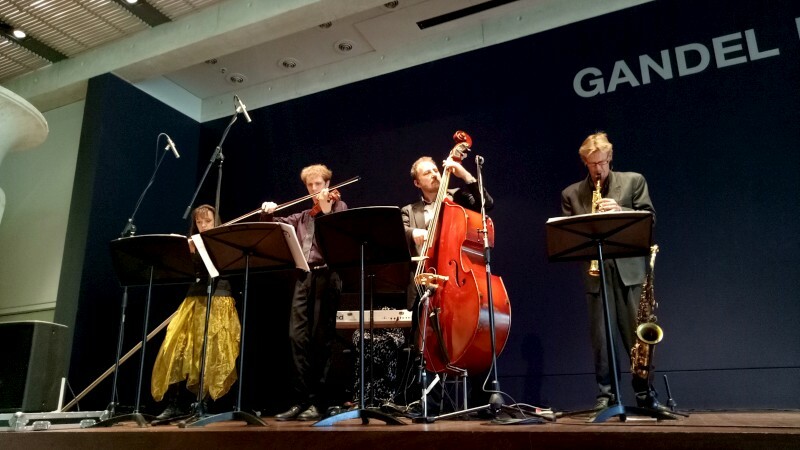 Topology comprised John Babbage (soprano, alto sax), Robert Davidson (bass), Bernaud Hoey (viola), Therese Milanovic (piano) and Christa Powell (violin). Gordon Hamilton (conductor) led the combined choirs. This one was exciting and a challenge. I'm filling in for Juliet in the bass seat in Musica da Camera and this was the first concert for the year. A program of Italian baroque led by a baroque specialist Bianca Porcheddu of the Australian Brandenburg Orchestra. 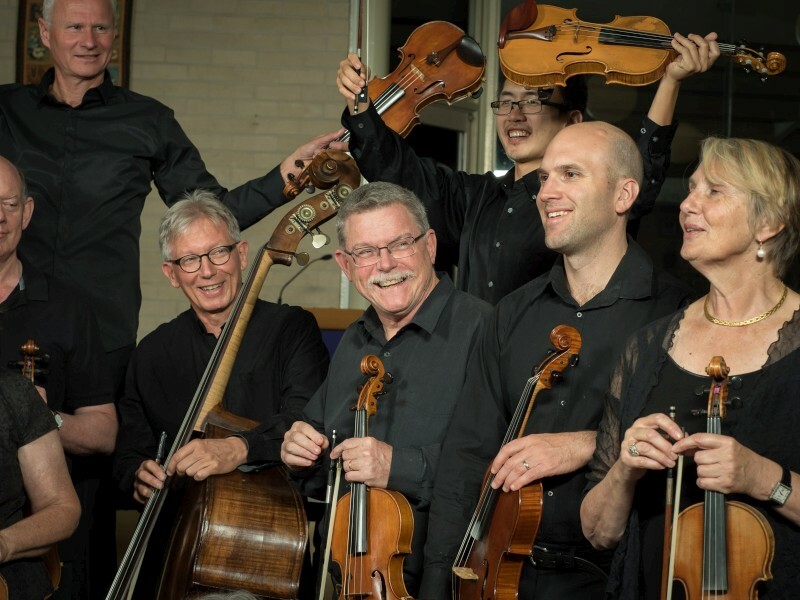 Musica da Camera is a string orchestra of about 25 players formed in 1979, so it has a history. It invites various conductors or leaders for a range of programs. Coming concerts are a mix of favourites, then ancient and modern, then classics and new-classics, so the repertoire is varied. MdC includes some professionals, from CSO or teachers, and some serious instrumentalists, so it's a worthy challenge. 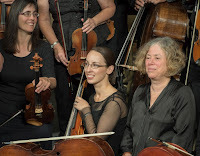 This concert featured famed names, like Handel, Vivaldi, Corelli, but also lesser knowns, Albinoni, Geminiani, Valentini and one I'd never heard of, Dall-Abaco, with a range of styles, ground bass with variations, a few concerti grossi, extra violin parts (4), canons. Bianca had us in fear ramping up the speeds in practice, but had some generosity on the day. 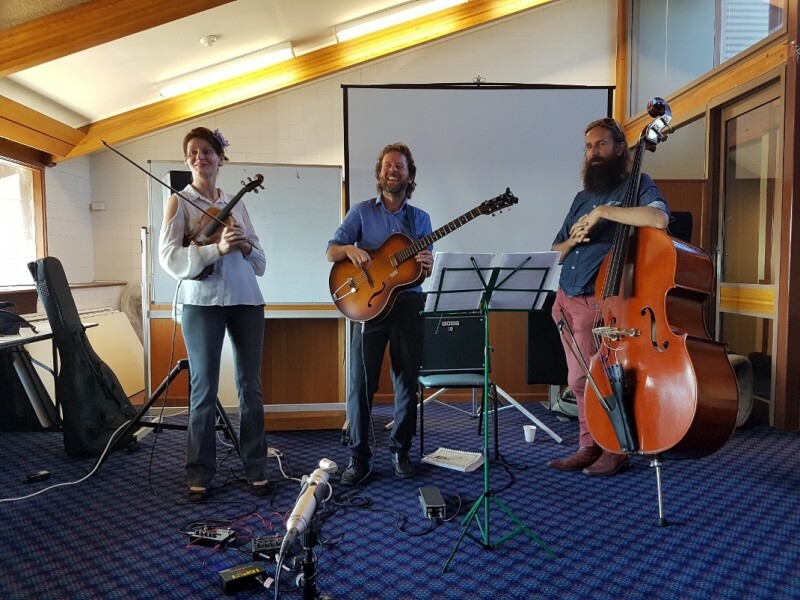 The room was full, the group played with verve and life that a bit of performance nerves brings out in you and Bianca did some lovely little fills and led with professional litheness. What slips there were were covered well enough and we left feeling satisfied with the performance. 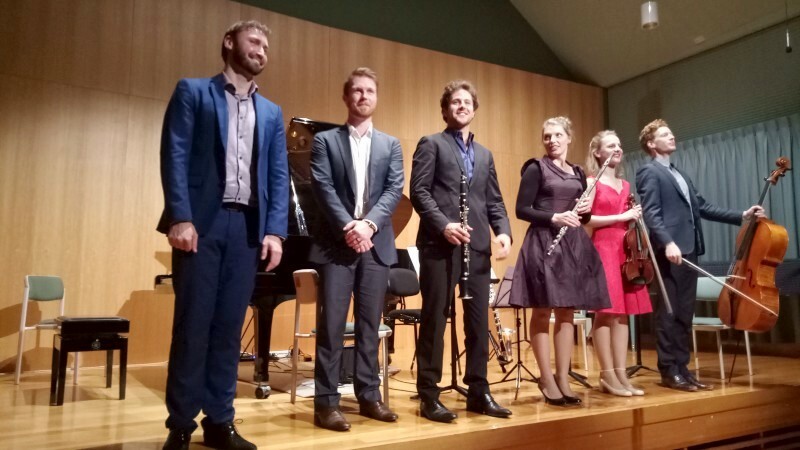 Thanks to Bianca, of course, but also to a great group of musos with considerable application to an ambitious program. We're not releasing our CD yet, but we are preparing to take on a piece written by Elgar in 1905 to highlight the virtuosity of the new London Symphony Orchestra. Mmm. Thanks to all. BTW, I was too busy for pics so I feature some a few from our photoshoot. 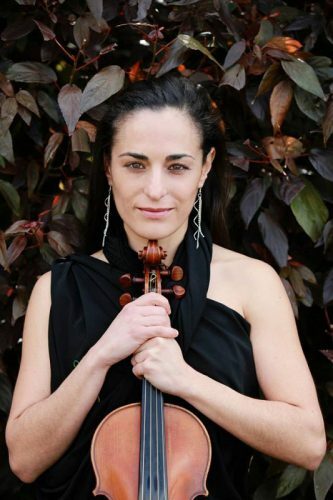 Musica da Camera was led by Bianca Porcheddu (violin) in a program from the Italian baroque. What a thoroughly hot outing. Tilt was playing at the Tradies but James was otherwise engaged (ask him: it's all a very happy event) so Hugh Barrett filled in for the night. Hugh has been in town for a few years for study and he has a history in Sydney, with Mothership Orchestra and various other notables. Suffice to say, he's a strong player who knows charts, has a good ear and strong on tonality but also on plays with dissonance and substitutions. To me, that adds up to much fun. So it was. Mostly standards, including some I haven't played for yonks, some very comfy latin grooves, some nicely driving funky and rock grooves, even an Elvis as a request. Some laughs there. But much fun. Thanks to Hugh and Dave. The concert was called Half the sky and the half was women. 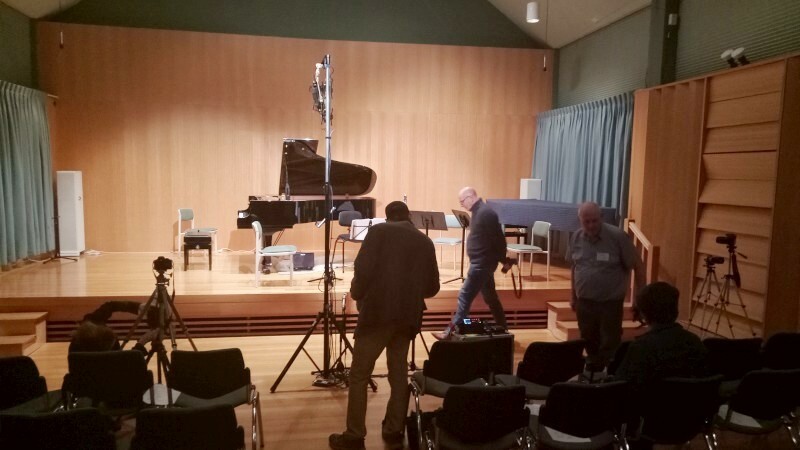 It was a CIMF event formulated around Ensemble Offpring and some ring-ins. EO plays music only by living composers, but this year they are playing music only by living women composers. 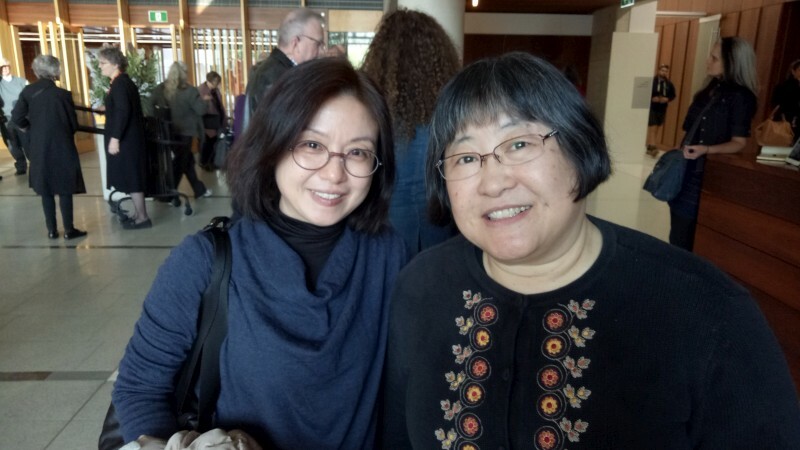 I expect little difference in the music (I liked how Chen Yi, female composer in residence at CIMF, put it: "we happen to be women writing music"), but a great opportunity to level matters. 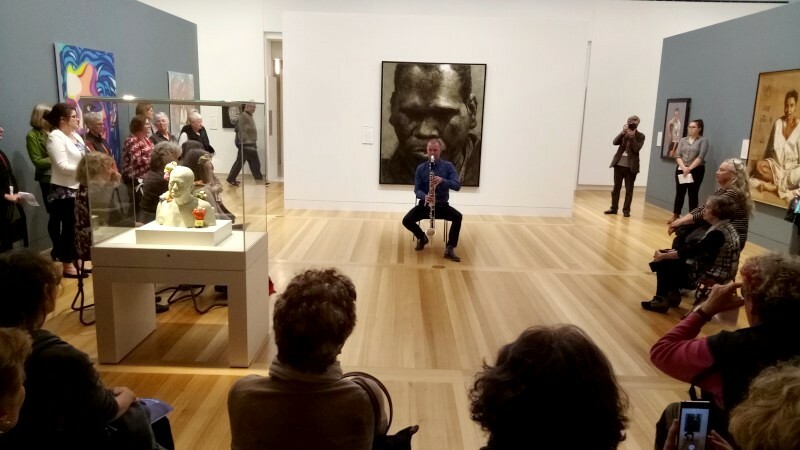 The concert was at and about the National Portrait Gallery, in various locations over several hours. First up was a performance in the foyer, by the sextet, then by a trio. Then a "promenade": four mini performances by soloists or small groups. Then a choice (not an easy thing!) amongst four pieces in four places at one time. 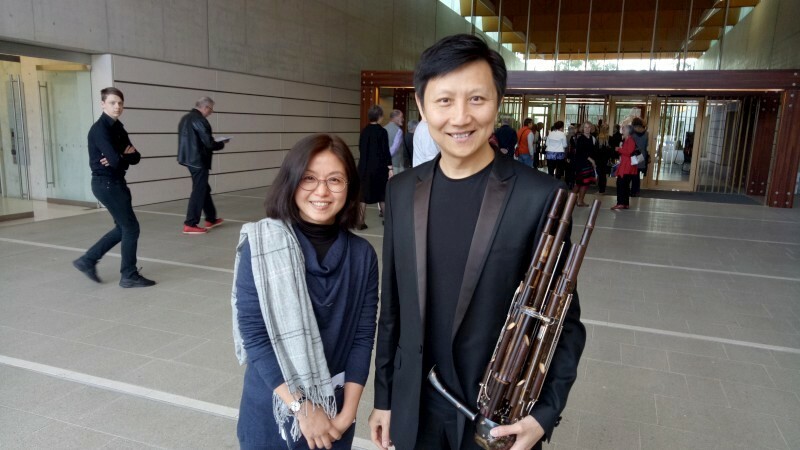 I happened on two by settled on third, Loo Sze-Wang playing sheng, a smallish, multi-piped free reed instrument, just to experience something different (not new: shengs date from 1,100 years back). 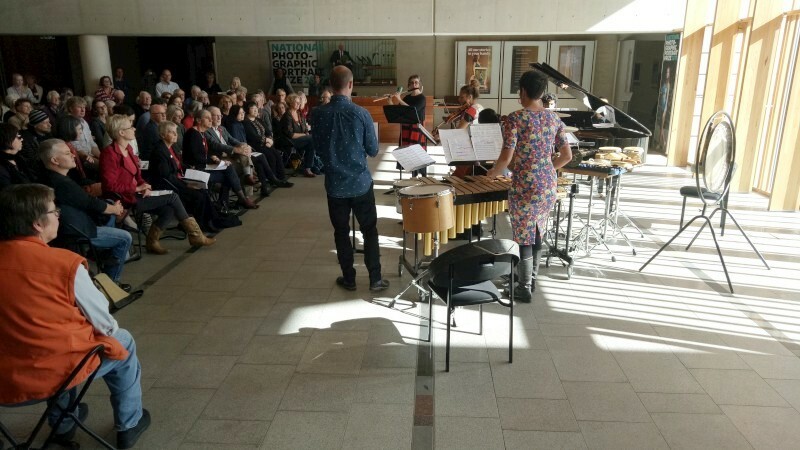 Then the forum, about women composers and more broadly about women in music, with Chen Yi, Claire Edwardes, Sarah Kimball (CSO), Sally Greenaway and Laura Tingle, chaired by Karen Vickery (NPG) and a final two pieces performed in the foyer, one by the current composer-in-residence, Chen Yi; the other by next year's c-i-r, Mary Finsterer. What stands out? Firstly, it was all fabulously interesting, challenging, edgy, read contemporary. The playing was mightly, but as a string player I particularly noticed Blair Harris on cello and was fascinated by the score he was responding to with all manner of new written techniques; Claire E's deeply satisfying rhythm and the pentatonics in her later solo on merimba had me feeling jazz, although another later work was more obviously classical-sounding; an impressive trio including some blissful playing on horn from Darryl Poulson; Loo Sze-Wang's cheng because it was just so new to me. 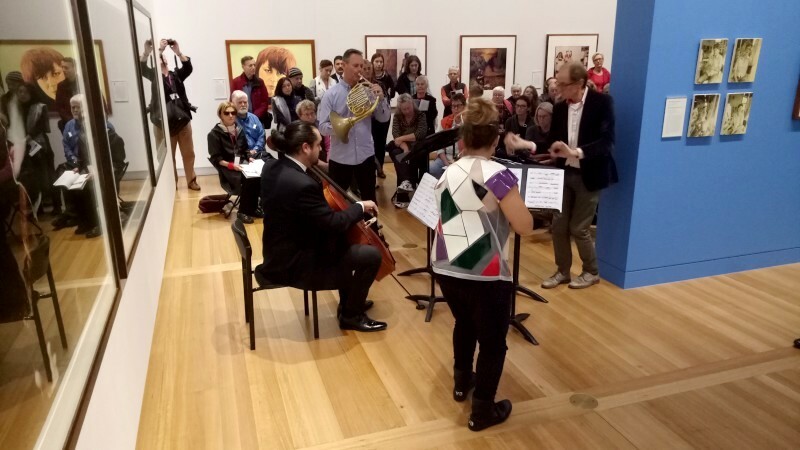 And some interesting comments in the forum caught my ear: what did we miss about Julia Gillard's time amongst "all that noise"; CSO's programming of 9 women with 6 commissions in a smaller group series curated by Matthew Hindson; Sally G observed that being a composer is "fraught", also that she'd come to love music by female composers she'd met (I guess she means some familiarity helps in music and otherwise: I feel that too); Chen Yi observed that action is most important (she spoke of the SF Women's Philharmonic and a competition for female composers); Claire's suggestion that women may not be "as bolshy" as male composers, calling on others to "listen to me"; it was generally recognised that history has left a male bias to the repertoire (not hard to think this!) and a "repair [is] all we can do now". 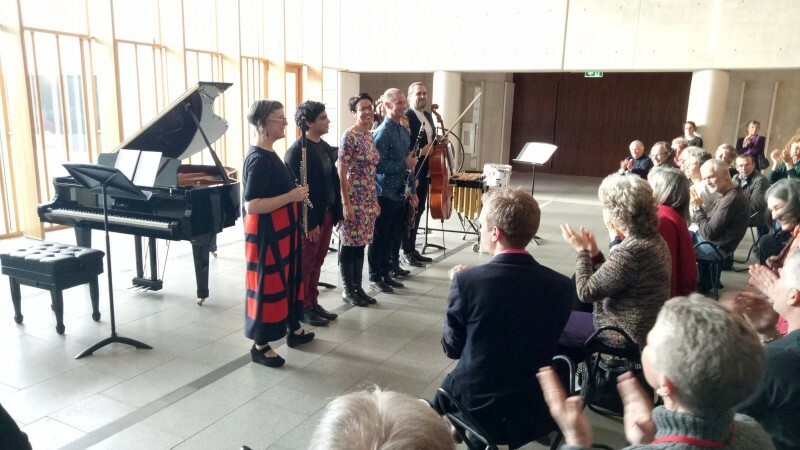 A great afternoon of intriguing contemporary music played with wonderful skills and with a political edge. Great! 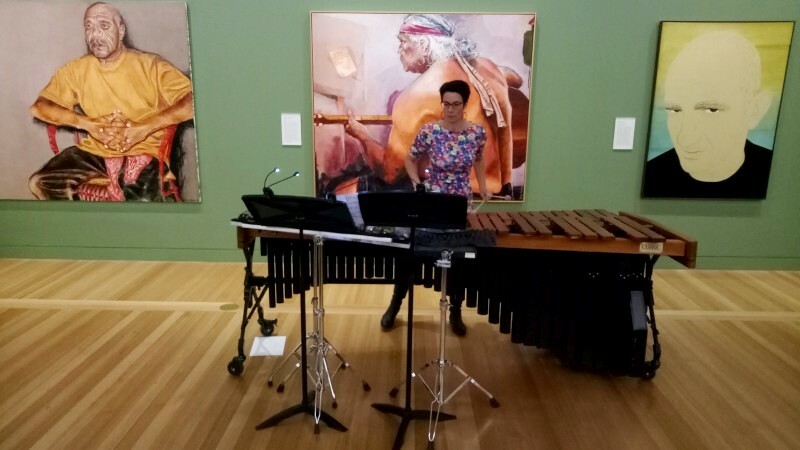 Half the sky was a CIMF concert at the National Portrait Gallery. Performers were Ensemble Offspring comprising Claire Edwardes (percussion, musical director), Jason Noble (clarinet), Zubin Kanga (piano), Veronique Serret (violin), Lamorna Nightingale (flute), Blair Harris (cello) with Ben Hoadley (bass clarinet, bassoon), Loo Swe-Wang (sheng) and Darryl PoulsEn (horn). 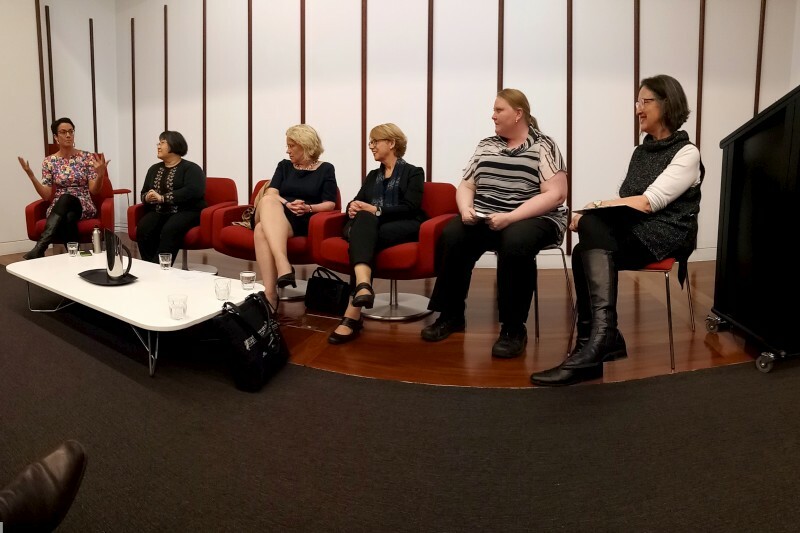 The forum comprised Chen Yi, Claire Edwardes, Sarah Kimball, Sally Greenaway, Laura Tingle and Karen Vickery. 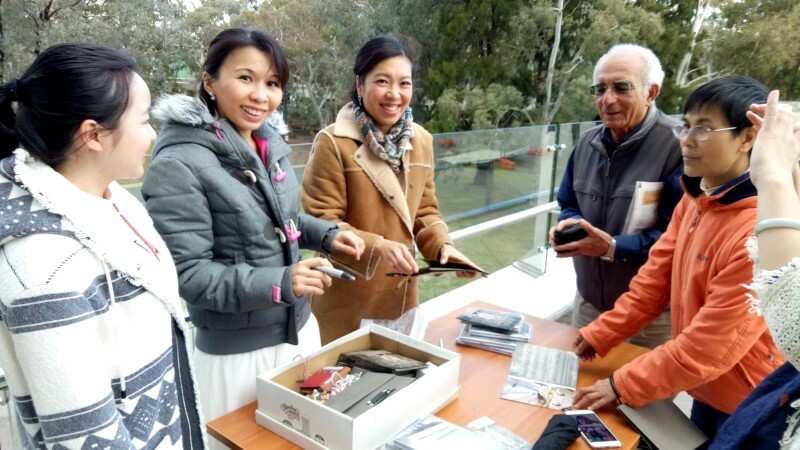 Composers on location were Chen Yi, Joyce Tang and Mary Finsterer (perhaps others).